Sunday morning and the towpath of the Regent’s Canal was a hectic place to be. Joggers – headphones plugged in and sweating from the heat of the sun – and cyclists fought for their share of the narrow space between the water’s edge and towering brick-built buildings. Things got even more interesting when the path went under bridges because the space was tighter. Pedestrians who simply wanted a gentle amble were forced to weave in and out of this busy traffic if they wanted to survive. Some considered it far safer to simply grab a newspaper and sit at one of the trendy cafes that have sprung up along the canal. They had taken the opportunity to top up their tans while enjoying a good coffee. One of the first canal-side pit stops I passed – Towpath – soon after setting off on my walk from Angel to Limehouse Basin was so popular there wasn’t a seat to spare. So I carried on a little further and found an inviting terrace up a few steps outside Arepa & Co cafe which allowed me to soak up the hustle and bustle. In the 30 minutes or so that I stopped here, not a single boat passed by. I had already seen plenty of colourful barges, but their owners looked a long way from being ready to start up their engines and set off on a drive. 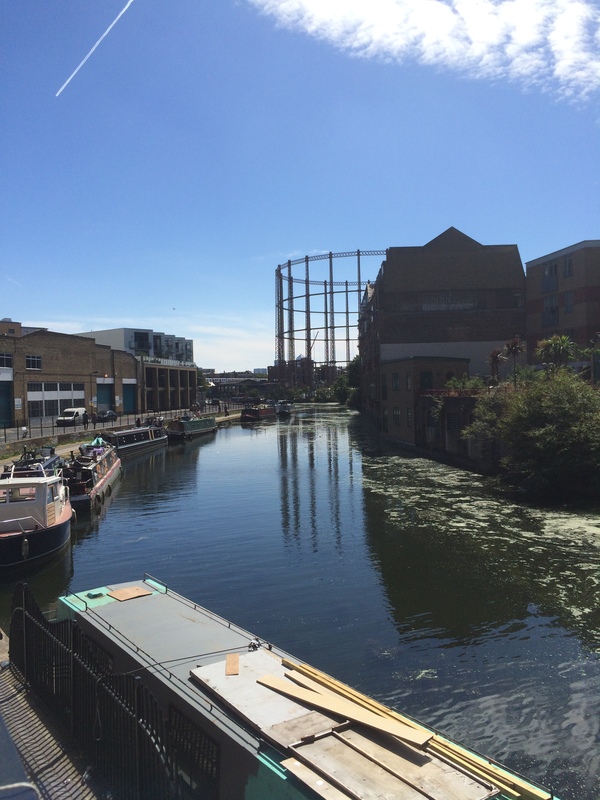 If you read my the first blog I wrote on the Regent’s Canal last week – charting a walk from Paddington to Islington – you’ll know that there has been quite a transformation along this stretch of water in general. 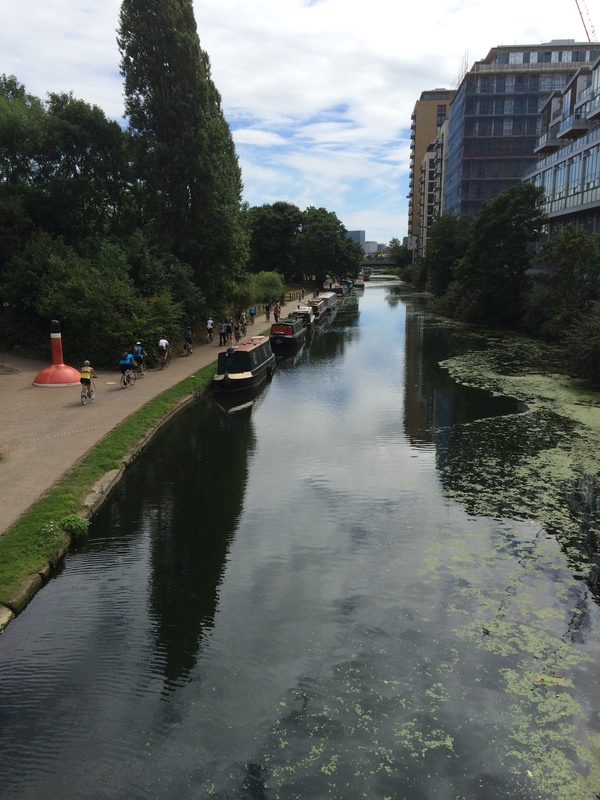 The eight and a half mile canal, which received parliamentary approval in 1812 and was fully opened in 1820, was promoted by businessman Thomas Homer to link the Paddington terminus of the Grand Junction Canal with London’s docks to the east. The Regent’s Canal boomed soon after its opening, with companies quickly snapping up canal wharves (many of these sites are now occupied by apartments). And the water itself became extremely busy, carrying the likes of coal, building materials and foodstuffs into and out of London. Thomas Pickford Limited boasted 120 boats pulled by horses by 1840. The canal was instrumental is carrying materials for the new north London railway termini to be built (Euston was the first to open in 1837). But, as I noted last week, soon the railways became competitors for the canals. And there was even talk of draining the waterway and turning the Regent’s Canal into a railway. It did however linger on, performing a key role in carrying munitions during the Second World War. But when it was nationalised in 1948 its importance to commercial traffic was dwindling and by the 1960s it was hardly being used at all (the closure of Limehouse Basin later in that decade was the final nail in the coffin). 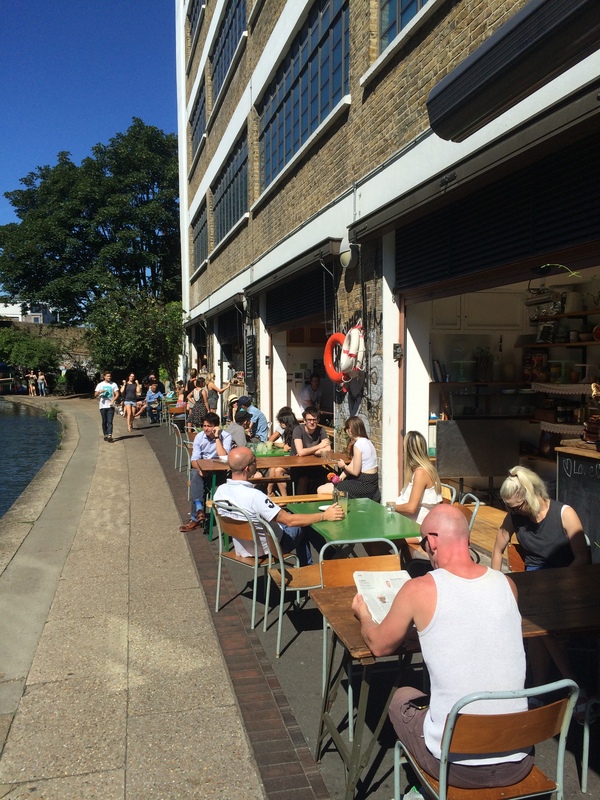 Today, the canal is thriving again thanks to leisure users and people opting to live on boats, as an alternative to London’s expensive property market. Many of the old industrial buildings remain and have been converted into apartments. Other new blocks have been built from scratch, with balconies overlooking the canal itself. The first section of the Regent’s Canal I encountered on this leg of my walk was particularly gentrified, with plush homes and the string of trendy cafes that I’ve already mentioned. I also soon passed turn-offs for Kingsland Road in trendy Dalston and Broadway Market (the latter a buzzing stretch with some great pubs, including the Cat & Mutton, leading up to London Fields, where the hipsters hangout). But the canal hasn’t been completely gentrified. I also walked pass some 20th century social housing towers. And I also saw that many businesses continue to operate here, including a self-storage warehouse right by the water’s edge. It’s fascinating the contrast – one minute you see a shiny apartment block and the next there is an industrial building in front of you. Much as I enjoyed my mango smoothie early on in the walk, I found the stroll particularly pleasant when I had parkland on my left hand-side, rather than being sandwiched in by buildings. 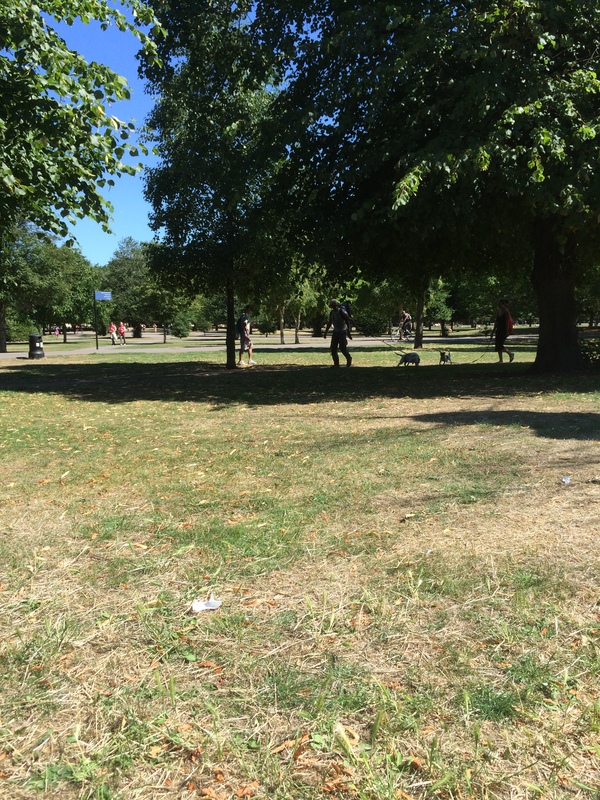 The long stretch of greenery began with Victoria Park, an amazing open space that was opened in 1848 as a vital amenity for working classes living in the East End and boasts a popular boating lake. More than 30,000 people signed a petition calling for the park – designed by James Pennethorne – to be created and over the years it has been the site of important political meetings and rallies (attracting prominent socialist speakers, such as William Morris and Annie Beasant). “On this lawn the listener, as his fancy prompts him, may assist on Malthusianism, atheism, agnosticism, secularism, Calvinism, socialism, anarchism, Salvationism, Darwinism, and even, in exceptional cases, Swedenborgianism and Mormonism. I once heard there a prophet, a man who professed to be inspired by the Holy Ghost; but this prophet ended by being locked up in an asylum, where he will have to convert the doctor before he can recover his liberty”. I then carried on along the river past Mile End Park, which has one of my favourite pubs at one end. The Palm Tree is a proper East End boozer and the interior doesn’t look like is has changed in more than half a century. And they have an old fashioned cash register that pings every time a sale is completed – which is pretty frequent on a weekend night (don’t even think about trying to pay with a card – it is very much cash only here). If you are there on a Friday night you are in for a treat as a jazz band usually performs. When I was last there they had lead singer, but by the end of the night I think half the bar had been up on the stage to sing a cabaret number (most seemed liked professionals). Visiting on an afternoon for my walk, it was busier outside however as people enjoyed a good beer in plastic glass on a grassy patch by the canal. On my walk I also discovered that a space by the Mile End Road was once the site of a pleasure garden. The New Globe Tavern Gardens thrived in the 1840s and 1850s, attracting up to one thousand visitors a day for entertainment and refreshments. The pleasure gardens were built on the site of an old reservoir by Thomas Gardener who had inherited the New Globe Tavern. He organised ballet performances and concerts, as well as firework displays and hot air balloon ascents. But when the popularity of the gardens began to wane in the 1850s, Gardener sold the tavern and the streets were redeveloped for housing. But the pub itself remains on Mile End Road. My previous explorations of this area have revealed that right through history there was considerable poverty in these parts. Thomas Beames visited in the 1950s and described the slum-like conditions in Limehouse – where sailors set off on new ocean-going trade routes fronm the 16th century and the location for London’s China town from the 1850s to 1950s – in his book, the Rookeries of London. And medical missionary Thomas Barnardo abandoned his trip to China so that he could instead help poor children in the East End, many of whom were living in terrible conditions. The first “Dr Barnardo’s Homes” for boys was opened on Stepney Causeway in 1870. And he also became very involved in the Ragged School Union, founding the largest such establishment in London right next to the Regent’s Canal in Copperfield Road. Today, the converted warehouse is the excellent Ragged School Museum. 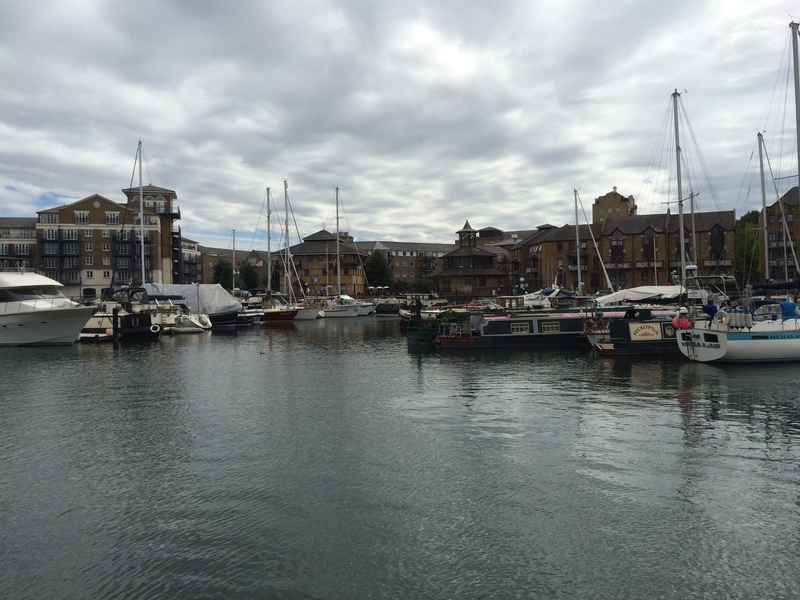 I reached the end of my walk at Limehouse Basin, opened in 1820 as the Regent’s Canal Dock and billed as the capital’s main gateway to England’s canal system. Here coal – and other commodities – was unloaded from colliers and transferred into barges so it could be used to power gasworks and later electricity stations. Trade at Limehouse Basin ceased in 1969, but this expanse of water remained and is today a marina, filled with plush leisure and surrounded by apartments, thanks to re-development started in the 1980s by the London Docklands Development Corporation. On the north side is a hydraulic accumulator, built in 1869, and powered the cranes, lock gates and bridges in the dock. The tall brick building remained in use until the 1920s, and following restoration, visitors can now access a roof-top viewing platform, which apparently has good views of the surrounding area (sadly it was closed when I passed). The railway arches next to the tower, and now used by the Docklands Light Railway, are also significant in that they form part of the second oldest urban railway viaduct in the world (built to carry the London & Blackwall Railway). Just as my walk started in very upmarket surroundings, I ended the exploration amongst some very expensive properties – apartments that would be beyond the reach of most Londoners. My stroll was a reminder of the inequality that remains in the capital today. But it was also encouraging to see former industrial plots of land prime for re-development. If built on, thus increasing the supply of available properties, could we be closer to solving our housing crisis?